The National Oceanic and Atmospheric Administration (NOAA) named Kenneth Graham, WX4KEG, to head the National Hurricane Center in Miami. Preparations at the NHC continue ahead of the 2018 hurricane season, which begins on June 1, following 2017's historic tropical weather season. Graham will pick up the reins from Deputy/Acting Director Ed Rappaport on April 1. More here. Amateur Radio presentations and workshops were conducted at the National Hurricane Conference, Hilton Orlando, Florida, on Tuesday, March 27, 2018, and were recorded. Readers can view the proceedings on the VoIP Hurricane Net site here. Presenters this year included special guest speaker Ed Rappaport, Acting Director, National Hurricane Center; special guest speaker Bob Robichaud, VE1MBR, Canadian Hurricane Center; Julio Ripoll, WD4R, WX4NHC Assistant Amateur Radio Station Coordinator; Mike Corey, KI1U, ARRL Emergency Preparedness Manager; Bobby Graves, KB5HAV, Hurricane Watch Net Manager; Rob Macedo, KD1CY, Director of Operations, VoIP Hurricane Net and ARRL ARES Eastern Massachusetts Assistant Section Emergency Coordinator; Bill Feist, WB8BZH, National SATERN Liaison; and Dennis Dura, K2DCD, VoIP Hurricane Net. In keeping with its theme, "Serving the Community," Hamvention®2018 is offering an opportunity for Amateur Radio groups to display the communication vehicles they use to serve their communities. A special area has been set aside at the Greene County Fairgrounds and Expo Center for emergency communication trailers, vans, trucks, and other vehicles. Hamvention organizers are hoping that emergency response groups such as ARES, RACES, CERT, and others with an interest in Amateur Radio emergency communication will take advantage. Groups that want to participate can obtain more information on the Hamvention website. ARRL President Rick Roderick, K5UR, used the occasion of National Volunteer Week, April 15 - 21, to express gratitude to "the thousands of Amateur Radio operators who have given, and who continue to give, of their time and expertise" to serve as vital communication links during emergencies, disasters, and community events. ARRL Emergency Preparedness Manager Mike Corey, KI1U, cited Amateur Radio's volunteer spirit as one of its most admirable aspects: "Radio amateurs have taken their passion for radio, communication, science, and technology and given back service in so many ways;" they "teach, inspire, offer insights to the world that others cannot, assist during times of emergency and disaster, and report to assist during such community events as marathons and festivals," he said. On April 3, FEMA announced that the agency is conducting its 2018 National Level Exercise for the whole community and invites other government agencies, representatives and organizations in the private sector, communities, and individuals to participate in this historic exercise. The 2018 National Level Exercise (NLE), based on a mid-Atlantic hurricane scenario, represents one key step towards implementing FEMA's recently released 2018-2022 Strategic Plan. The ARRL has had a longstanding relationship with the Federal Emergency Management Agency, formalized in its most recent memorandum of understanding, which can be viewed here. The 2018 National Level Exercise, which takes place April 30-May 11, is the first major exercise following the release of the plan. The exercise supports its three goals: Build a Culture of Preparedness by empowering the country to participate and enhance their own preparedness for future disasters; to build FEMA, its state and local partners, and all participants' readiness for potential catastrophic events; and to reduce the complexity of FEMA by closely incorporating its partners into the exercise. The exercise will test lessons learned from the 2017 hurricane season. To learn more, see http://www.fema.gov/nle. In February, it was announced that Darrell Davis, KT4WX, the Section Manager of the ARRL West Central Florida Section, in agreement with Craig Shapiro, N1MSS, the logistics coordinator for the National Multiple Sclerosis Society and Jason Triolo, KD4ACG, the Amateur Radio communications coordinator for the Bike MS Citrus Tour in 2017, that the West Central Florida Section would assume responsibility for coordination of Amateur Radio communications for the Bike MS Citrus Tour. Volunteer levels had slightly declined and it was felt that with the assistance of the West Central Florida Section that recruitment of new volunteers could fall under one banner and be given a more coordinated, concerted effort. "Everyone who has been performing their respective assignments will continue to perform them as they have with no changes. Mike is the new Amateur Radio coordinator and will continue in his new role as he has before and is doing a great job with the new Citrus Tour website as well. We shall continue to welcome help from all those who have helped in the past and hopefully we will see a lot of new volunteers this year." On Saturday, March 17, ARRL Puerto Rico Section leaders met with the section's ARES Emergency Coordinators, and representatives of the Puerto Rico Power Authority (PREPA-AEE) and island hospitals that have shown interest in establishing Amateur Radio stations for emergency back-up communications when another Maria-scale event occurs. Also present were representatives of the new Puerto Rico Emergency Management Bureau, taking notes and sharing ideas for fostering mutual assistance among these agencies during incidents.The Bureau reps also discussed the possibility of reducing the number of Zones that divide the island for disaster response purposes. incidents. District Emergency Coordinators and Emergency Coordinators have been mandated to fill out and file these forms for the SEC's and ARRL HQ's information and use for planning and reporting purposes. Meeting attendees discussed the utility of the popular Winlink software for sending e-mail protocol messages via radio and a global network that links the Internet to amateur stations by means of nodes on both HF and VHF/UHF systems. The Winlink discussion was followed by an examination of NVIS HF antenna configurations for local/regional communications coverage. A draft set of frequencies to be used for future emergency/disaster response situations and drills was discussed. A presentation of the ARRL's After Action Report of the 2017 Hurricane season was also discussed, with emphasis on Hurricane Maria impacts and response, and the Red Cross/Amateur Radio "Force of Fifty" mission on Puerto Rico. incurred in maintaining the repeater systems for emergency/disaster response communications. 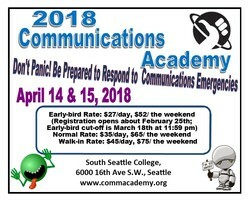 2018's Communications Academy was held last weekend at South Seattle College in Seattle, Washington. Communications Academy is a non-profit coalition of volunteer radio communications teams that provide a high quality, professional-grade training opportunity for the various emergency communications programs, individuals and groups around the Pacific Northwest. By providing a once-a-year large-scale venue for training, volunteer communicators are exposed to topics in emergency management, communications techniques and protocols, real-life emergency responses, and other pertinent subjects, which might not otherwise be available to them. In past years the academy has been able to attract several nationally known speakers for the keynote sessions. The Communications Academy is open to anyone with an interest in emergency communications, volunteer or professional. The presentations are designed to promote the development of knowledgeable, skilled emergency communicators who will support their local communities during a disaster or emergency response. The planning committee for the Communications Academy includes members from ARES, RACES, ACS, medical and public safety agencies. The 2018 Communications Academy theme was "DON'T PANIC! : Be Prepared to Respond to Communications Emergencies." The keynote speaker was Robert Ezelle, Director of Washington Military Department's Emergency Management Division (EMD), who spoke on "Disaster Response and Emergency Communications." He concluded that "the importance of Amateur Radio cannot be overemphasized. It will play a critical role following a major disaster." Numerous seminars and programs were conducted over the weekend. Sarah Miller, K7SKM, a Certified Emergency Manager (CEM) spoke on "Communications in Catastrophe: A view from Hurricane Harvey" and examined impacts to the community, including response and recovery, from a communications perspective. Scott Honaker, N7SS, spoke on the subject of "Antennas Demystified - Antennas in Emergency Communications." He covered antenna designs most commonly used for emergency communications. Kenny Richards, KU7M, discussed "HamWAN - What, Why, and How?" HamWAN is several things, including a local group of amateurs who have built a high-speed IP based network over Amateur Radio in the Puget Sound area, as well a standard for how other groups can build a similar network. An extensive Beginners' Track featured a series of six individual classes, and a special simplex radio net for members of the beginner's series to monitor and participate in to help get experience with, and become comfortable with, using their radios. A separate workshop was set up to help hams learn to program their radios. Robert "Tom" Cox, VE6TOX, helped attendees in "Understanding Communications Failures." This presentation provided types of communications failures along with specific examples from various disasters illustrating the points. Ward Silver, N0AX, ARRL publications writer/editor and QST Contributing Editor, spoke on grounding and bonding, AC safety, lightning protecting, RF management and grounding systems. Silver also presented "Contesting: Training for Public Service Radio Fitness"
Scott Currie, NS7C, gave a "Winlink Express Installation and Configuration Overview," covering installation, configuration, and operation of the Winlink Express client software and other utilities, focusing on V/UHF packet radio operation. HF operation was also briefly covered. Dale Williams, WA8EFK , Director, Great Lakes Division, ARRL Board of Directors, presented "ARES Advances into the 21st Century, discussing the significant changes to the ARES program, at the national level, which are being planned by the ARRL Public Service Enhancement Workgroup. Program Chairman Marina Zuetell, N7LSL, ARES District M Assistant Section Emergency Coordinator for Western Washington Medical Services Communications, reported "This year, we had nearly 350 participants who came from all over Washington, Oregon, British Columbia, and Alberta. For the first time we had Pacific Section Manager Joe Speroni, AH0A, from Hawaii attend, and he vowed to return and bring his Section Emergency Coordinator next year. This was particularly meaningful since we opened the conference, relevant to our "Don't Panic!" theme, with the videoclip from the Hawaiian "missile threat" and the tribute to Amateur Radio. We also had attendees from Montana, and a couple of other states. We had many enthusiastic comments about the great networking opportunities, as well as the many and varied topics. Great fun was had by all." Zuetell thanked the committee for its great work in putting the event together, as well as the sponsors, exhibitors, and speakers. Also thanked were the teams with communications vans who came and showed off their creativity and expertise in the pouring rain! For more information, see the Communication Academy's website here. The InfraGard article in last month's issue of the ARES E-Letter was great to read, but ARRL members may misunderstand the scope of the area cited. The Los Angeles InfraGard Chapter covers seven counties: Los Angeles, Orange, Riverside, San Bernardino, San Luis Obispo, Santa Barbara, and Ventura. This would include the ARRL Los Angeles, Orange, and Santa Barbara sections, not just Los Angeles. It should also be noted that there are 82 chapters of InfraGard in the U.S., so opportunities exist throughout the country. Many Santa Barbara Section members have attended training (for free) from the FBI via the InfraGard program on a number of timely subjects, and a number of active ARES members are trained as a Terrorism Liaison Officer (TLO). The course trains students in the information sharing intelligence-gathering mission, which is crucial to the war on terrorism. The course explains the mission of the Joint Regional Intelligence Center (JRIC), the primary duties of a TLO, the proper handling of sensitive information, and the organizational structure of the Intelligence Community.This is right up our alley. Using this system, the description of a "Breaking Storm coming in from the North, with Strong Winds and Snow" can be reduced to "WX (is) 2726N". Alternately, one could say "WX (is) 27261", but all the cardinal compass points are shorter to send than their Scale numbers. A description of a "Pleasant, mostly clear Spring day, with calm winds" might be "WX4341", omitting the Wind Direction character if Wind Speed = Calm. The scalar values for Temperature, Sky, and Wind all increase across the scale. Only precipitation combines the phases of water with severity, with 4 being neutral. But the gradient is easily understood, and rigorous reference to the cheat sheet table is as unnecessary as for RST. The category order T, S, P, W, D may be remembered by the mnemonic "Too Soon Pass Wild Days" and no calculator is required to judge the Scale to 1/8th mentally, as we do so with greater precision for RST. A day that is 4444W is easily understood to be a fine day. Many Spring and Fall days will be 5555S.